Below is just a sample of some of our most recent projects. We will be constantly creating, and shooting more of our work, so keep coming back! Perhaps your car or bike will be next! 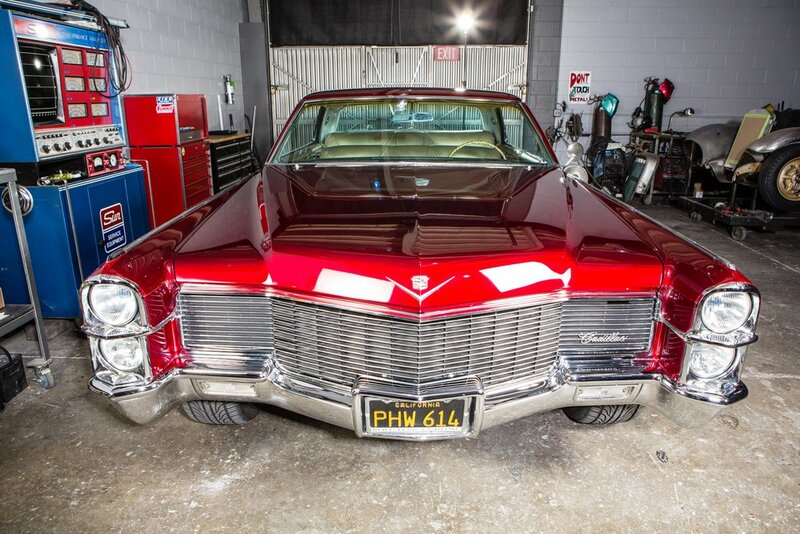 This 1965 Cadillac came to use in fairly good condition on the exterior but needed some love on the interior, in the trunk and under the hood. 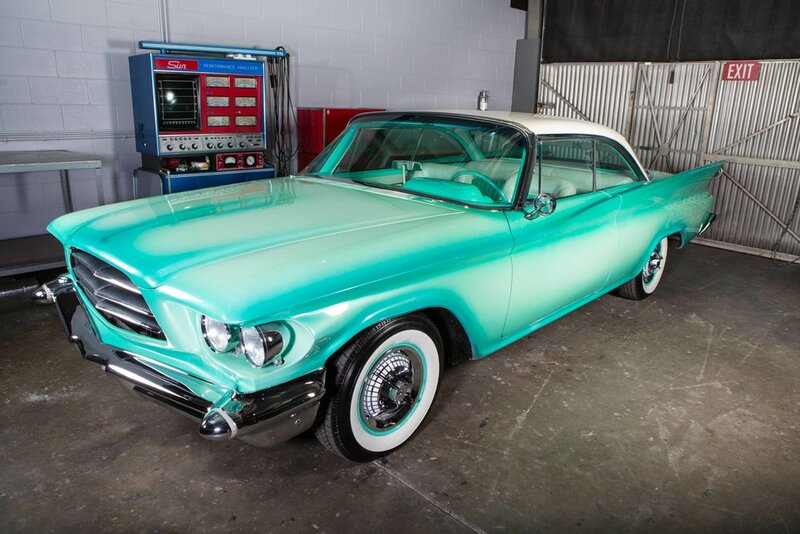 We thoroughly enjoyed taking this cool car to the next level! 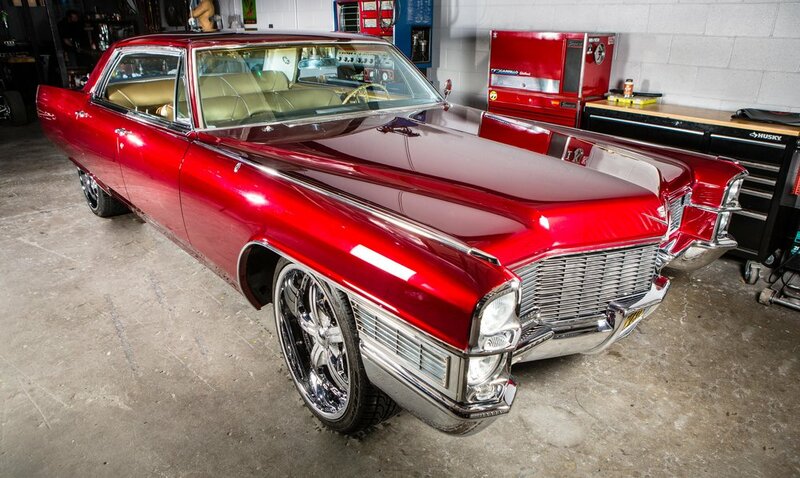 Around the shop, we fondly nicknamed this Caddy Ron Burgundy, because face it, with itsZZ502 Ramjet engine, this car IS the balls! 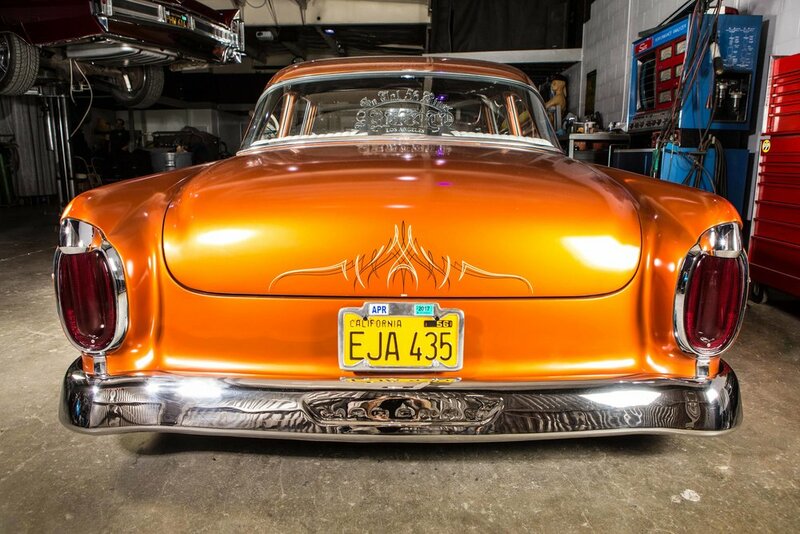 To make this cool car even cooler, we installed a new thermostat, dual monster electric fans with controller and a Magnum Mark IV Vintage Air System. Even with the little to no under dash and glove box space in the '65 DeVille we managed to make this massive air conditioning system work. A basic safety inspection and fluid change was completed. 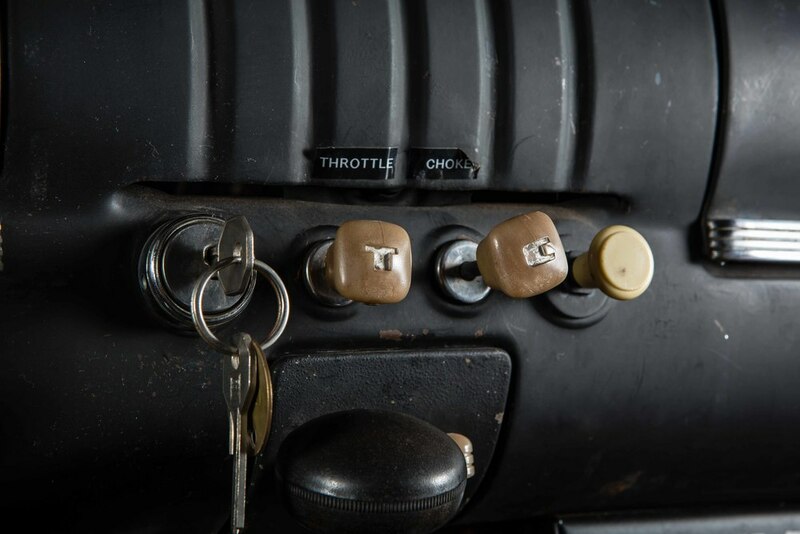 We then got all of the little things to work that some people take for granted in their classics like all the gauges including the speedometer, lights, switches, horn and emergency brake. A basic safety inspection and fluid change was completed. We then The fuel system was repaired, removing the fuel cell that was in the trunk and securing a new tank under the car equipped with new lines, pickup, high flow fuel pump and fuel injection. 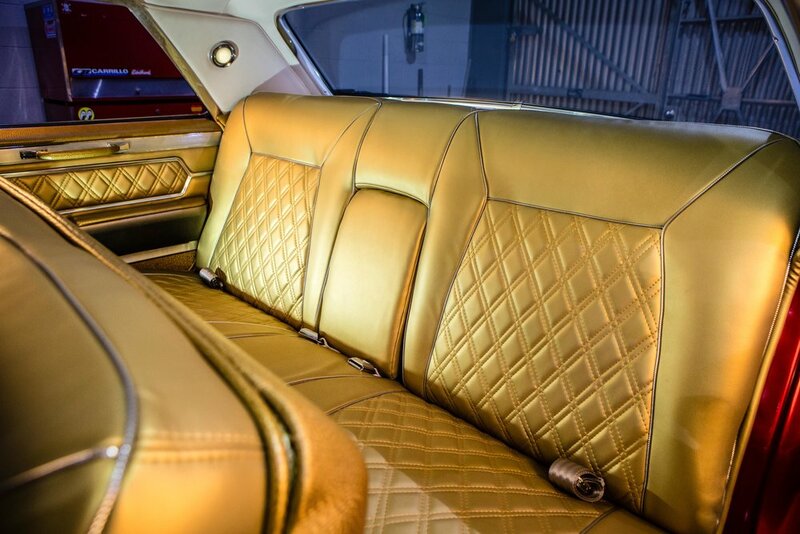 The enthusiastically worked with the owner to design the ultra-classy double stitched diamond gold interior with chrome tinsel trim, custom gold carpet and brushed white pearl roof with white pearl accents. 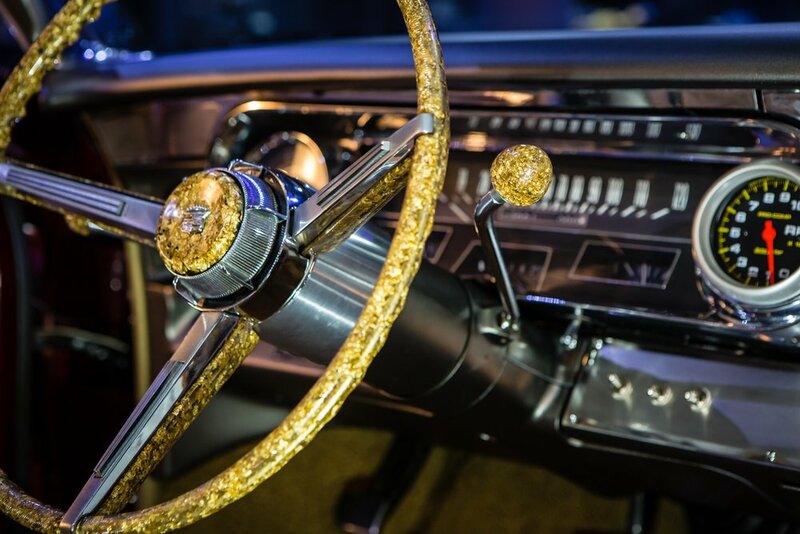 We hand-casted the new steering wheel, horn emblem and turn signal knobs in resin with 24 karat gold. 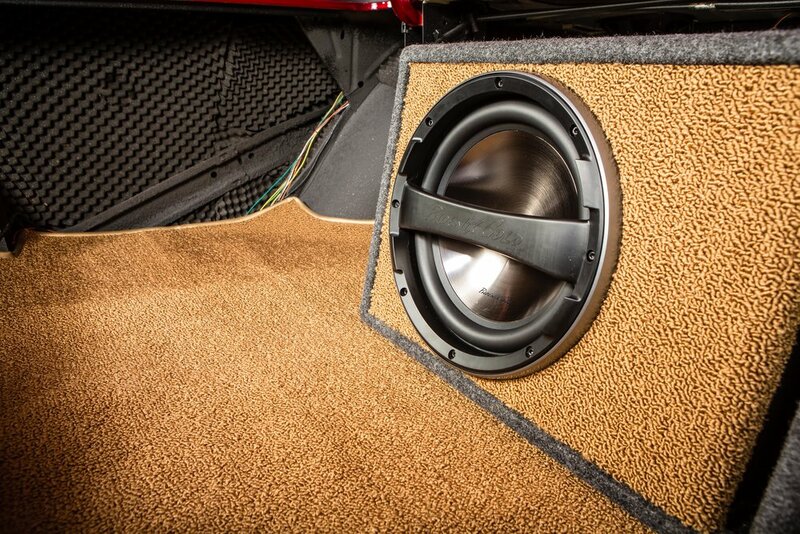 We then installed a new blue-tooth stereo system to make the interior sound as good as it looks. 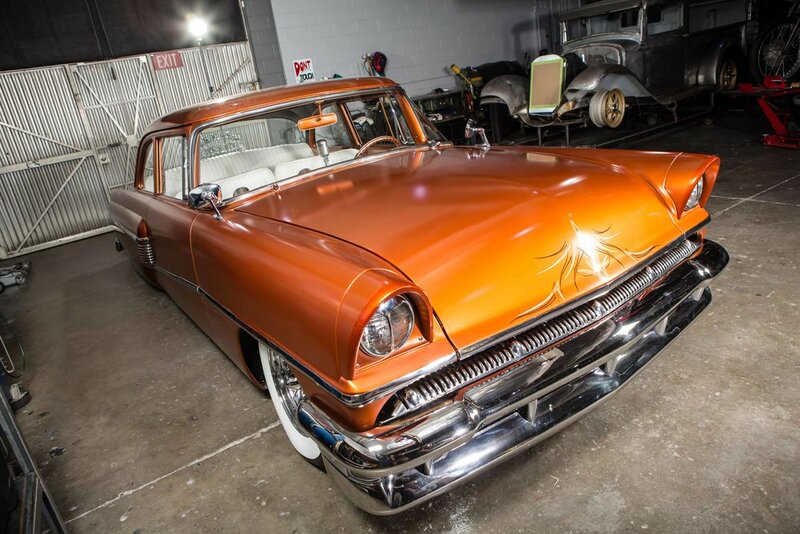 A very cool looking car to begin with, this 1956 Mercury Metalist came to us in nice condition but had a few things that the client wanted upgraded as well as repaired. In just a few short months we were able to finish his vehicle for him and take it to the next level! 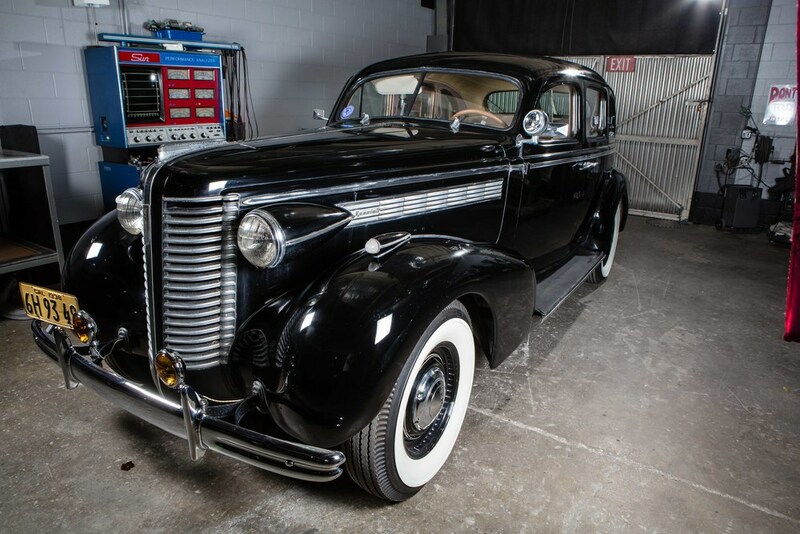 The electrical system received a new wiring harness, a new alternator with a heavy gauge wire, the battery was set up in the trunk in a secure and vented battery box and remote entry system with door poppers was integrated. 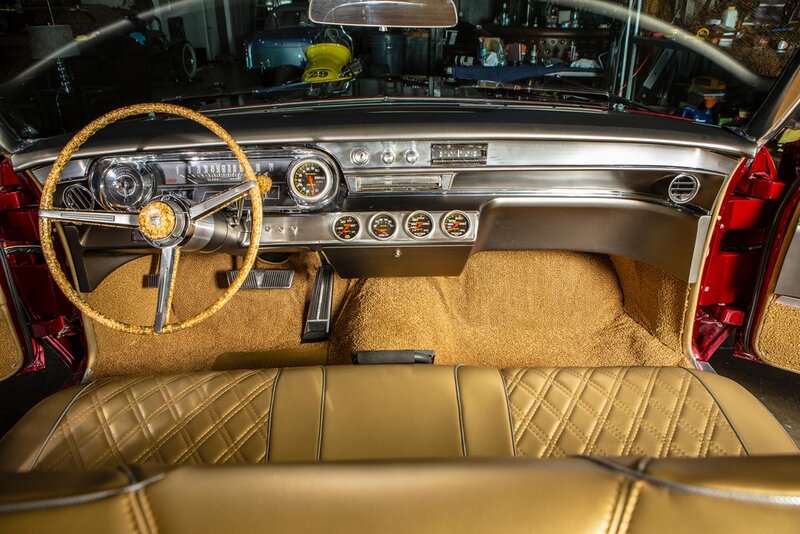 A stereo, speakers and sub-woofer were installed to provide some rockin' tunes for the driver as he changes gears on his custom shift knob which was created using a 1955 microphone that was used by none other than Elvis Presley! As if this car wasn't already cool enough a Vintage Air system was installed and the dashboard modified to fit the new vents along with a custom clock and new gauges. The dashboard was then body worked and painted to match the metal flake roof and was finished off with pinstriping by our good buddy Doug DoRr. 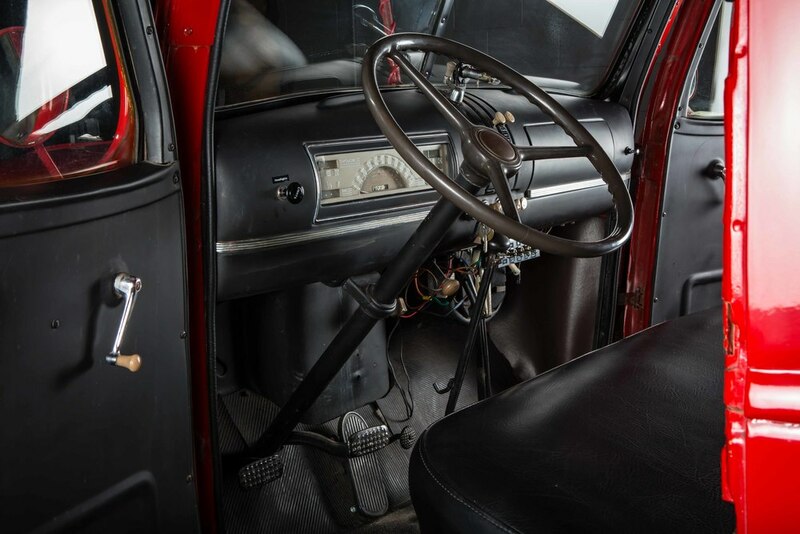 The existing steering column was disassembled and modified, welding up shift holes and setting up an indicator for shift positions and a power steering system was added. 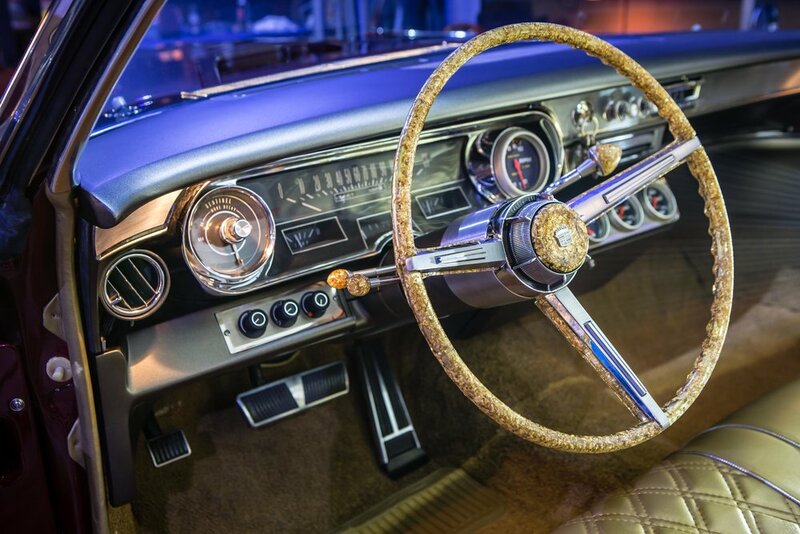 The horn button was repaired and it was all topped of with a new Con2R steering wheel which we painted to match everything else along with a custom Mercury Man horn center cap. To help this car stop on a dime, the brake system was rebuilt and adjusted receiving all new lines, hoses and components as well as a front disk conversion and a boosted master cylinder. New weather stripping was installed for the windows, doors and trunks and all new glass was installed. The windows received new felting and adjustments. 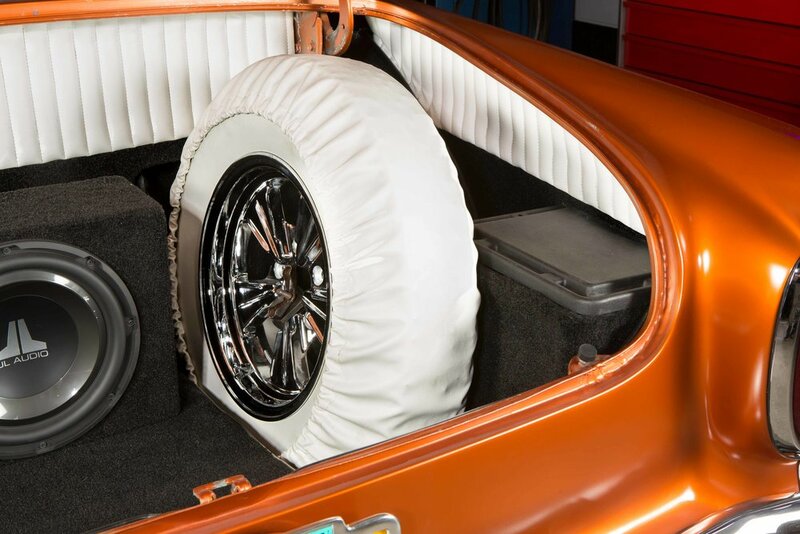 The vehicle had an air bag system installed in the car to begin with but the owner wasn't very happy with it. To make it a better ride, more like what you would feel in a modern Mercedes or Land Rover, we installed a self leveling ACCUAIR suspension. 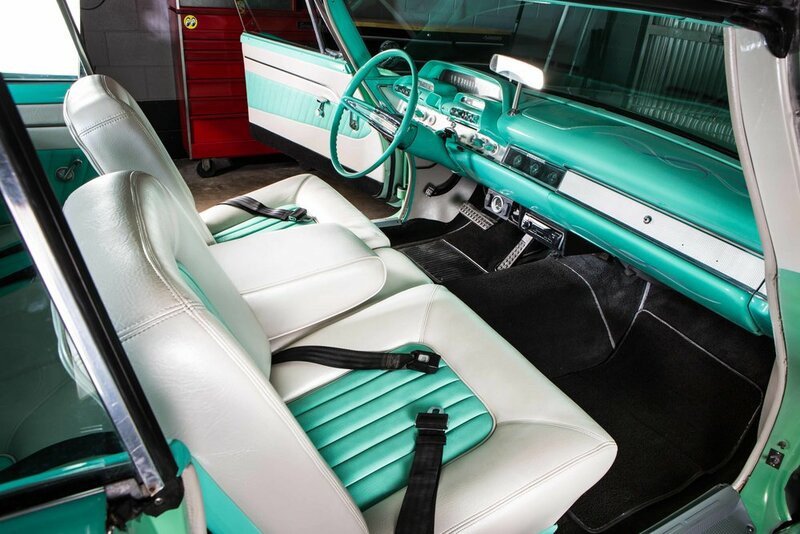 A new interior was created and installed in the car including seats, a custom center consul with cup holders, new carpet, upholstered trunk, seat belts, new door seal plates and LED lighting in the doors to light up the ground when entering and exiting the vehicle. 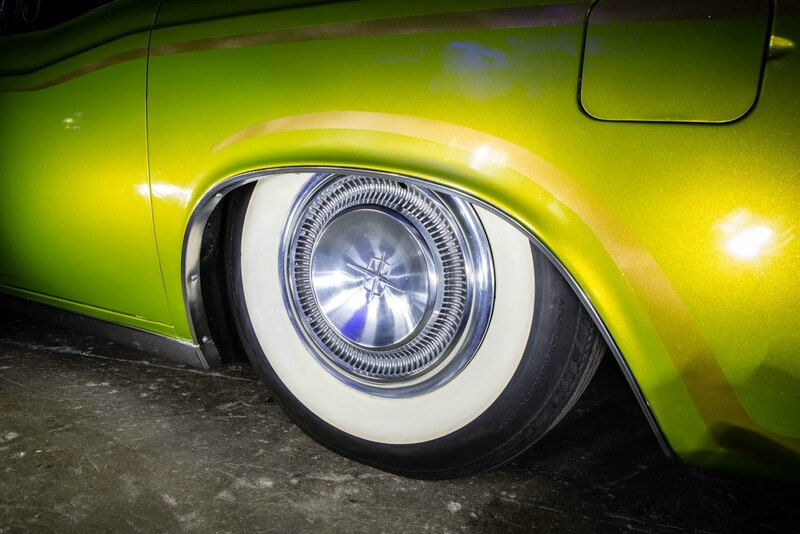 A new set of Radir Tri Rib wheels were chosen for this car then chromed and wrapped with new Coker white wall tires. The cooling system was in need of some overhaul so we installed a new radiator, thermostat, condenser thermostatic switch, controller and electric fan. A custom bracket was needed to fit the new radiator, fan and condenser and all was topped off with a custom made radiator cap. 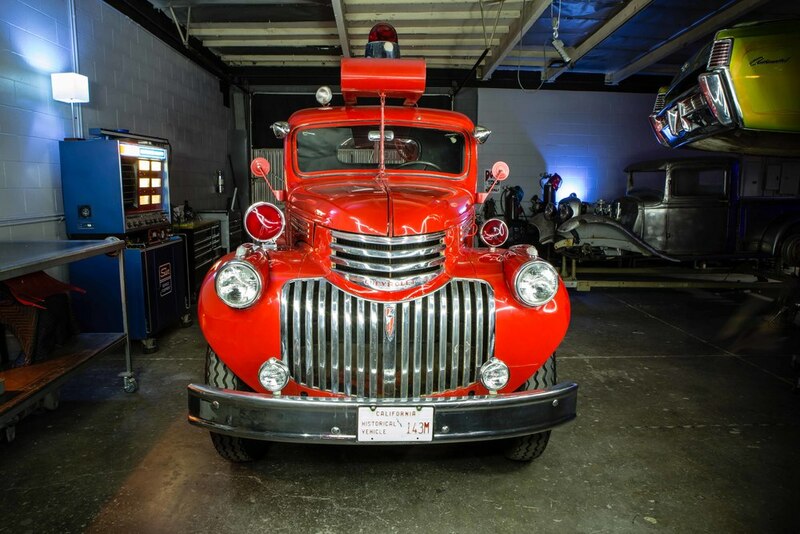 The engine compartment was brought to the next level by when we fabricated & installed aluminum panels spraying them along with the underside of the hood, to match the copper base and metal flaked roof. We cleaned up and did some final touches on miscellaneous items along with some chroming and fitment. 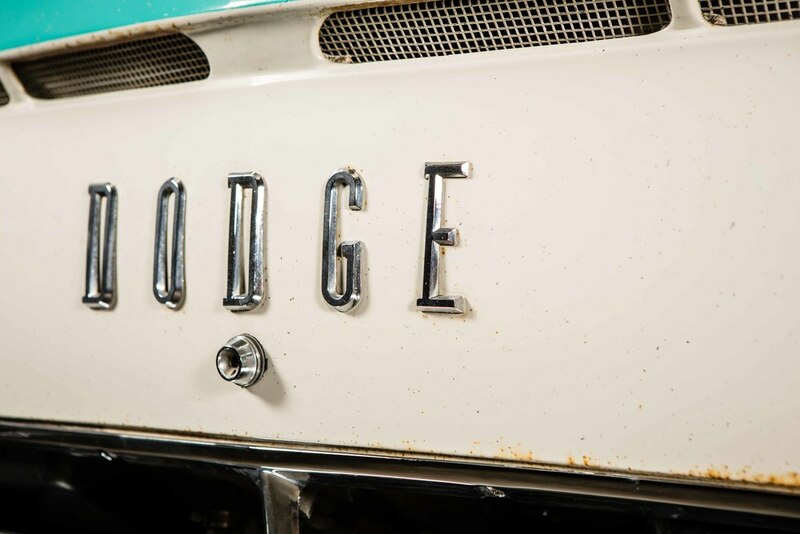 The finishing touches on the car were the unique Mercury man hood ornament and the rear window plaque which was graphically designed by Matthew Means then cut out of stainless steel and chromed. 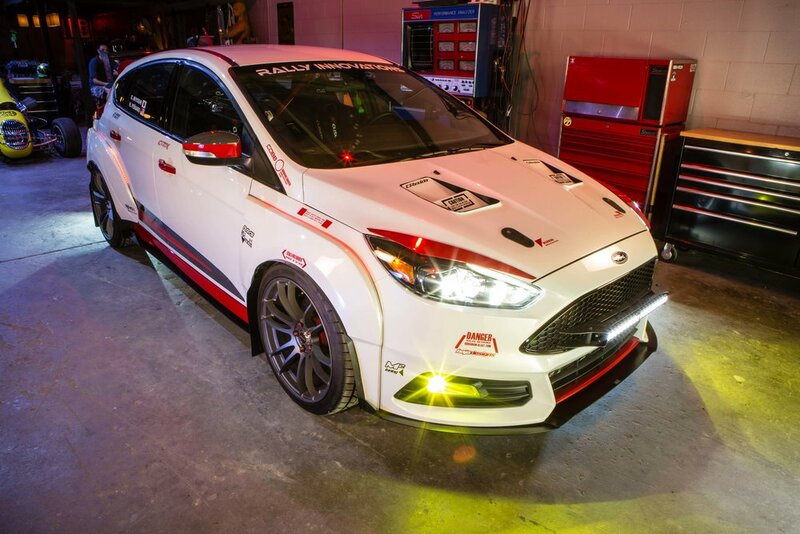 This incredible project was worked on in collaboration with Rally Innovations. 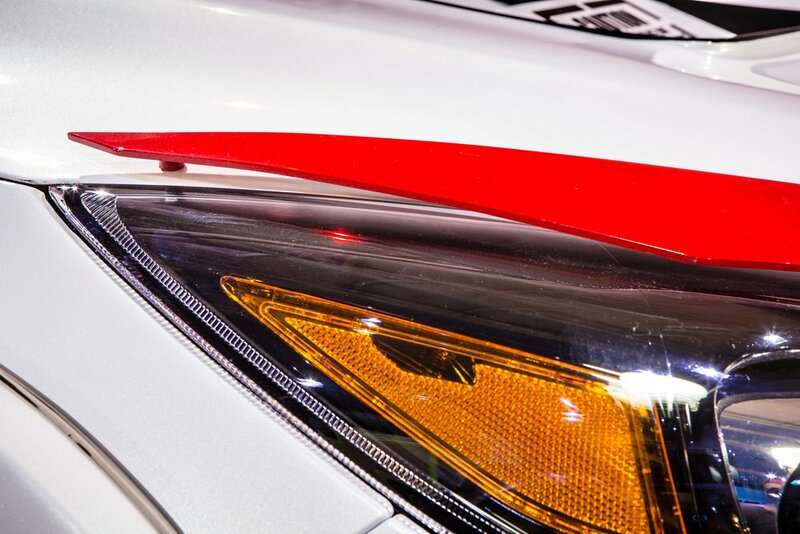 Tons of details and specifications coming soon! The owner of this van originally brought this vehicle in to make it road-worthy. He purchased it from a fisherman he most likely used this van for function rather than fashion. We cleaned the van out, re-chromed the bumpers, installed new side mirrors, red-line tires, and got her road-worthy. 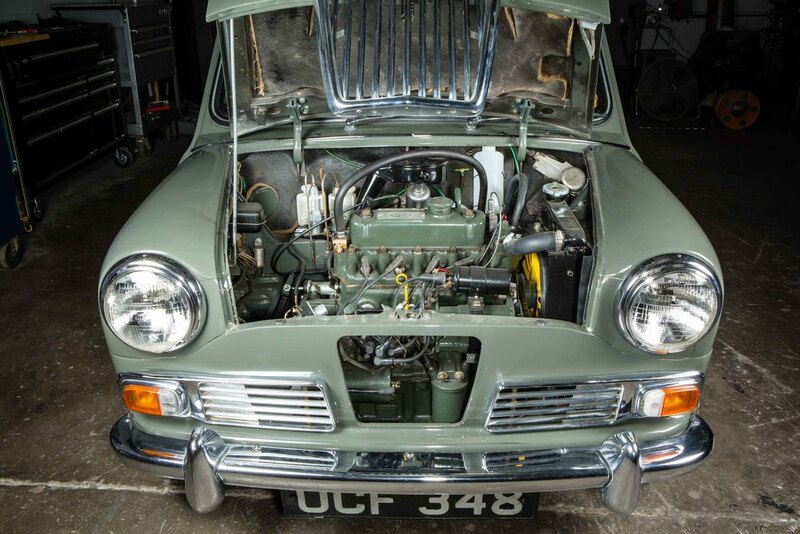 The original brake system was rebuilt and the engine serviced and tuned initially. All fluid systems were serviced and all of the bulbs were replaced. The paint was color matched and touched up here and here. The roof, the area most weathered, was resprayed completely. After a summer of driving it and realizing how much he truly enjoyed his "Mystery Machine" the owner brought it back to receive a few more finishing touches. 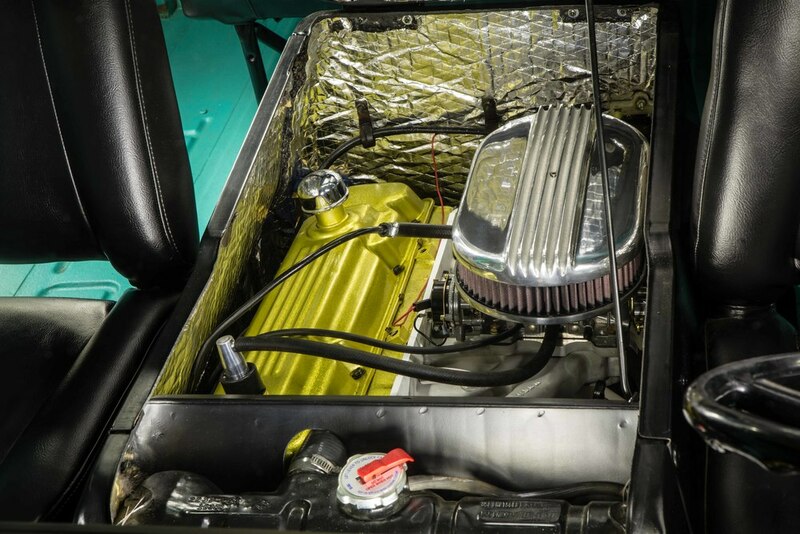 This time we installed a rebuilt short block engine but before setting it down on the new motor mounts, we custom painted it with HOK gold paint and added Lime Gold metal flake. The surrounding dog house was repainted and received new insulation. The transmission was rebuilt. A new water pump, Edelbrock 1403 carburetor, Offenhauser intake manifold, new header set, new vacuum advance electronic distributor with high performance advance curve, new distributor cap, and rotor installed. Plus, a new wiring harness, electronic control unit and new ballast resister. 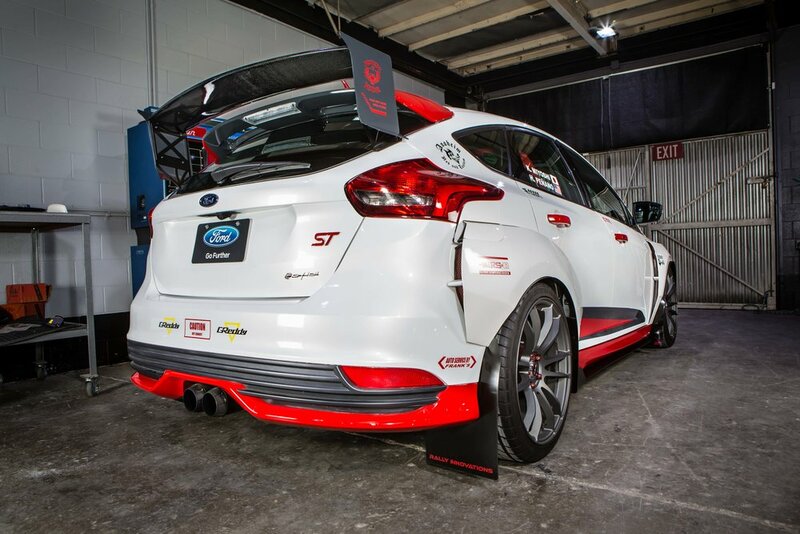 The headers were modified slightly and powder coated white by our friends at Embee Performance. The interior was pulled out and we removed the old paint from the floor board. 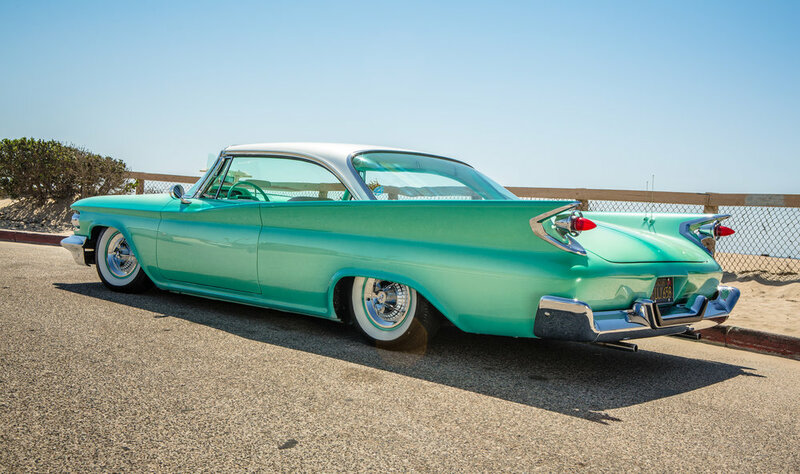 The floors were then sprayed with a urethane bed liner for which we matched with the exterior color of the vehicle, not only for fashion but to serve as insulation, sound dampening and a durable floor base that can withstand California beach sand. 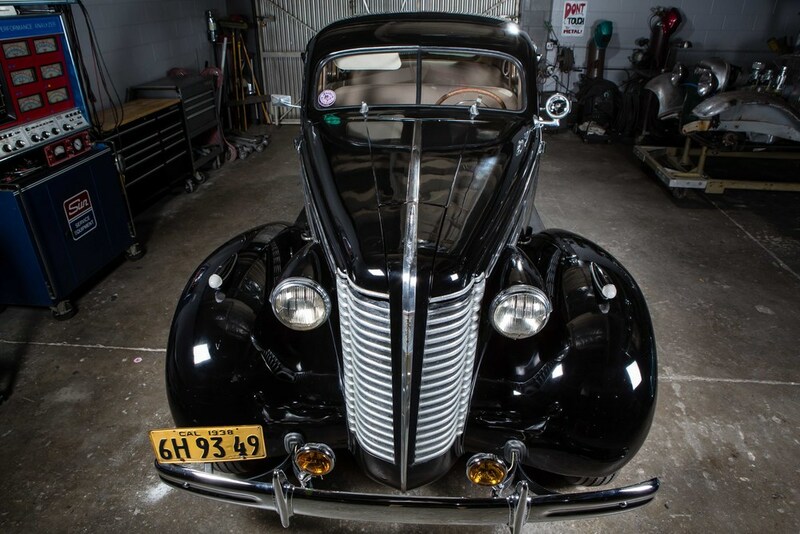 The upholstery was also restored: seats were reupholstered, and the glove box and sun visors were repaired. 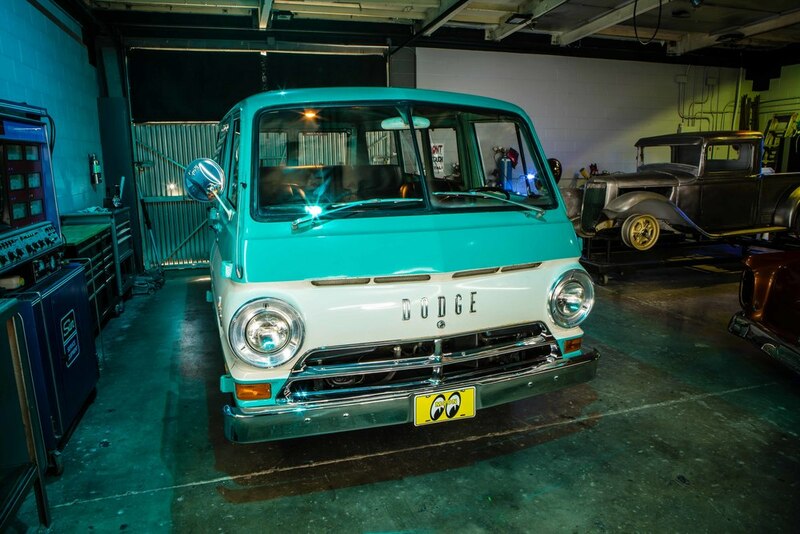 Please check back soon on our blog page for a feature article about this Dodge A100 Van and its adventures on the road! Ground up full restoration project completed by Anaheim Rod and Custom as a promotional vehicle for Agave Underground tequila company. This vehicle was completely disassembled and reassembled in house. The frame and underside of the car was cleaned and both were painted. The drum brakes were rebuilt and restored. New brake lines and brake system components were added. The fuel system received a new fuel pump, carberator, the tank was cleaned and resealed and new fuel lines and fuel filter installed. We swapped the engine in the car from a Camaro engine that was in it to a Small Block Chevy 350 that we rebuilt. A rebuilt overdrive transmission was put in the car. We installed a custom air bag system with 9 switches, and custom exhaust. The car was basically a rusty shell when we received it. All the rust was removed and repaired, and then it received body work and a fresh coat of House Of Kolor Jet Black Shimrin 2, with the USC-01 Clear, and the KD 3000 series Black sealer. All of the trim was redone and chromed and installed back on this big beautiful vehicle. All of the interior pieces were repaired, chromed or painted. The gauge cluster was repaired and repainted. We equipped the car with a new wiring and a JL Audio system. 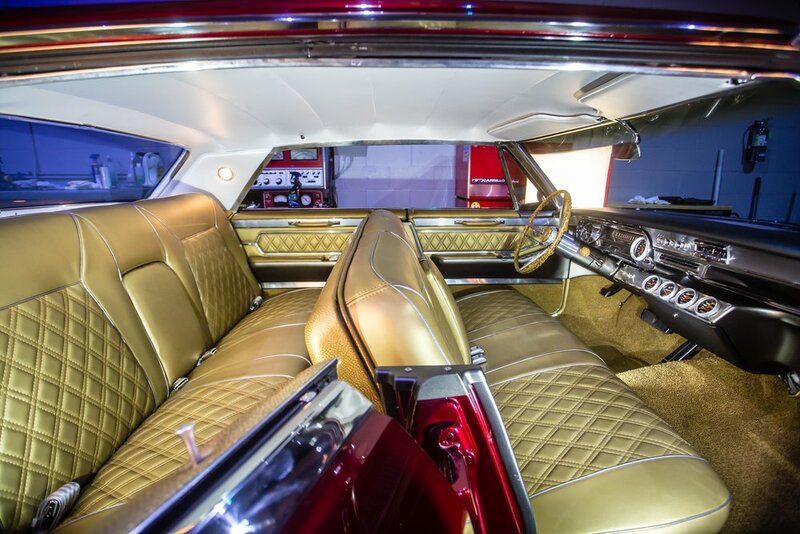 The vehicle also received a custom interior design with upholstery that somewhat resembles the inside of a coffin equipped with a maroon velvet headliner. The steering wheel was restored. The car received custom designed, carved, and cast emblems on the hood ornament and interior that match the Agave Underground Tequila logo. 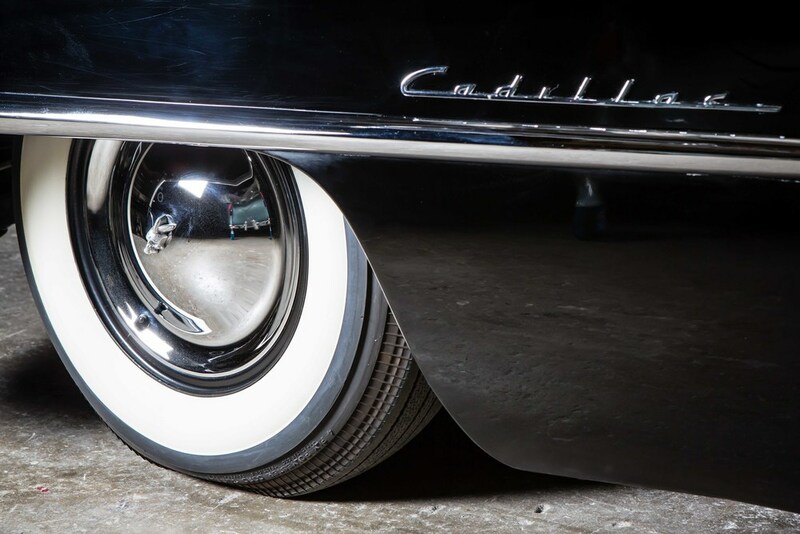 Custom hubcaps were also created to go onto the new Coker wide white wall tires. 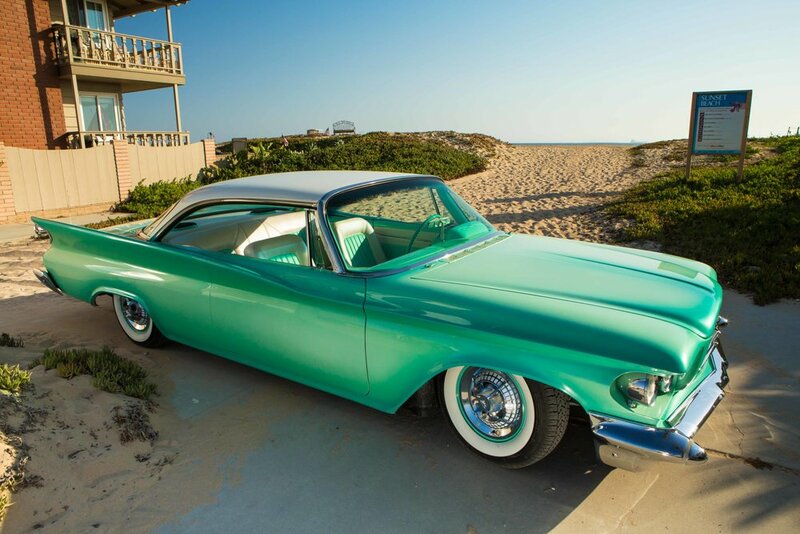 We hope that our client and the Agave Underground tequila customers enjoy this car as much as we enjoyed working on it. We had the pleasure of doing mechanical repairs and adjustments along with some final finishing to get this vehicle prepared to be sold. The car would not roll when it arrived to our shop. We had to repair the wheel cylinders, bleed the brakes, and adjust the brake system. The transmission was not shifting, we had to repair a short in the shift selector, clean up the wiring and re-hook up the trans. The ignition wiring had to be repaired. Minor leaks were chased down and repaired. 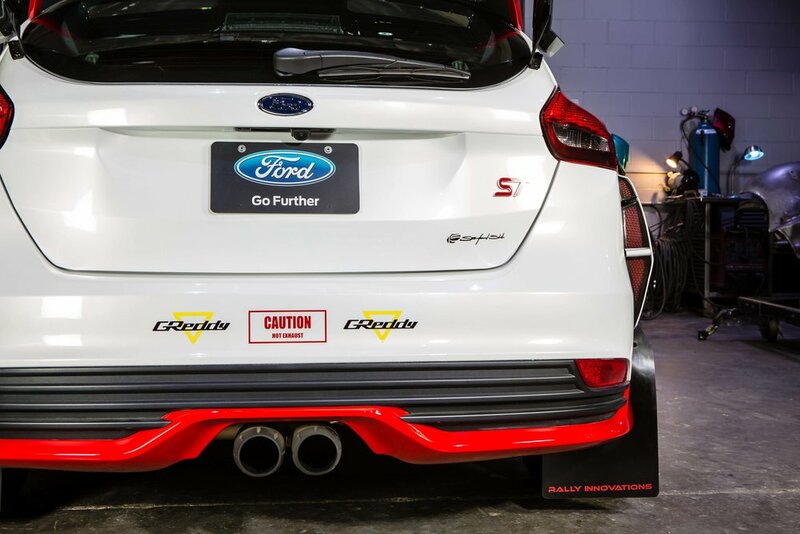 The gravel shields were installed on the rear fenders. The hood alignment was adjusted and the radiator paint touched up. Lastly, the engine was timed and tuned and all components tested then, she was ready to drive out of our shop and into the heart of a Cord collector. 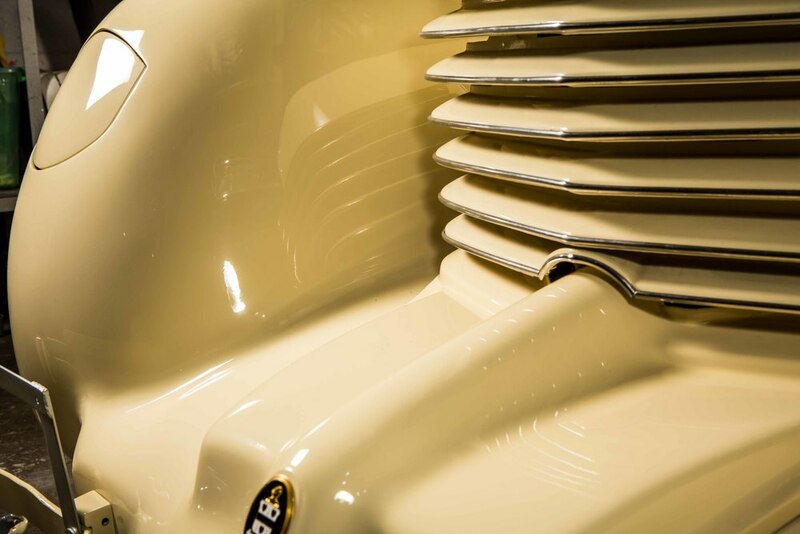 The engine compartment was restored, rust repair was performed and the vehicle was painted and detailed back to it's original color. All of the engine externals and components were also detailed to match it's original released condition. 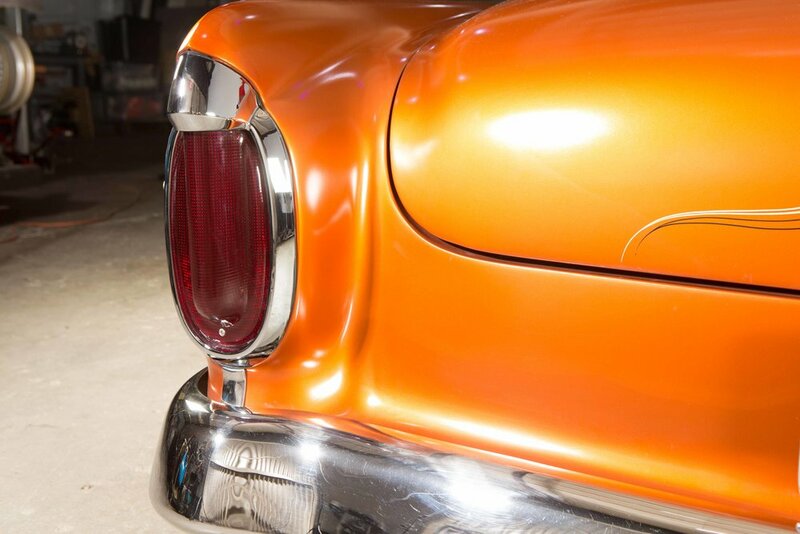 The body exterior was also given a rust repair on the quarter panels and some of the other joining areas. The main body was sanded, bodywork and then painted, color sanded and buffed. 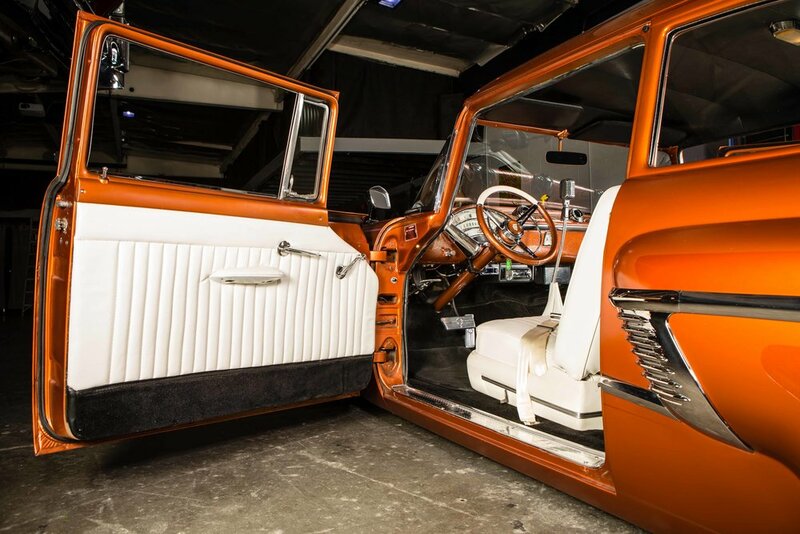 The interior was restored and the dash was custom hand painted checkerboard, then laminated and restored. The plan behind the Falcon Sprint was to get it running and driving safely down the road for it's happy, newly licensed, 16 year-old driver. 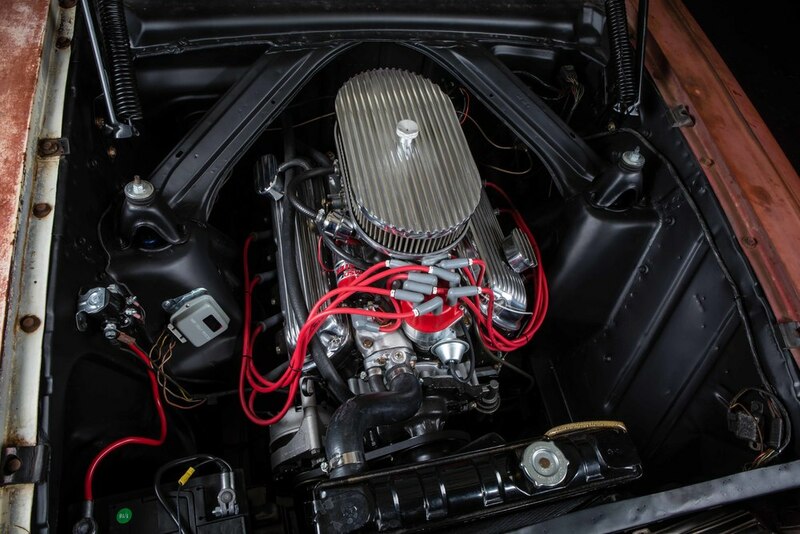 The original engine was pulled and replaced with a rebuilt Ford 302 equipped with: a new performance intake, 4 barrel Edelbrock carburetor, MSD electronic ignition system, finned valve cover & air cleaner from Speedway Motors, new water pump, new balancer, new pulleys and belts. The transmission was inspected, cleaned a reassembled. We conducted a complete rebuild of the brake system back to stock by making new brake lines in house & installing all new brake hardware. New shocks were installed all around. A new fuel tank was put in the vehicle and a complete clean out of the fuel system and lines was conducted. The electrical system was inspected and all components fixed. The instrument panel voltage regulator was replaced and some other light work on the gauges was performed. A rusted and missing battery tray was repaired and a new battery tray installed along with a new battery, new cables and a battery hold down. The alternator and starter were rebuilt and reinstalled. We cleaned and sanded the engine compartment and painted it a semi-gloss black. The hood hinges were cleaned, blasted, painted and lubed. A new key set for the ignition, doors, trunk and glove box were installed along with a new glove box itself. A rusted hole in the roof was repaired and primed to match the rest of the car. All of the Falcon's windows, window tracks, latches and handles were cleaned and lubed to open or roll up and down. New front and rear window glass was installed. All trim pieces were found, cleaned, polished and assembled on the car. All the fluids in the car were replaced. Some exhaust work was performed and new Cherry Bomb glass pack mufflers were added. Seat belts were also installed all around to keep this new driver safe. 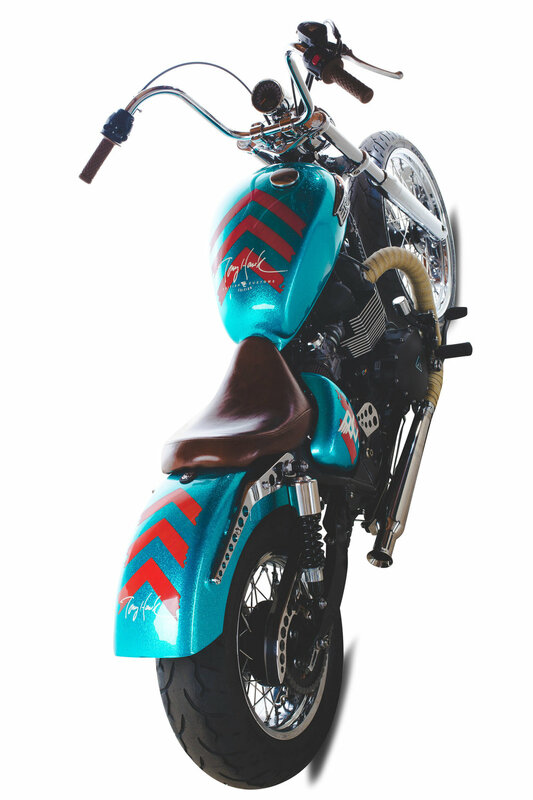 A custom painted Triumph Bonneville tank with an Evil Knievel design scheme. The bike was nicknamed "EVEL JUNE". Custom painted, base is a custom mix of phosphor (glow in the dark blue) small metal flake and white ice pearl, 5 coats of candy cobalt blue for the blue designs and 5 coats of apple red for the red areas, then laid copper and gold leaf, with custom lettering and pin striping by Doug Dorr. 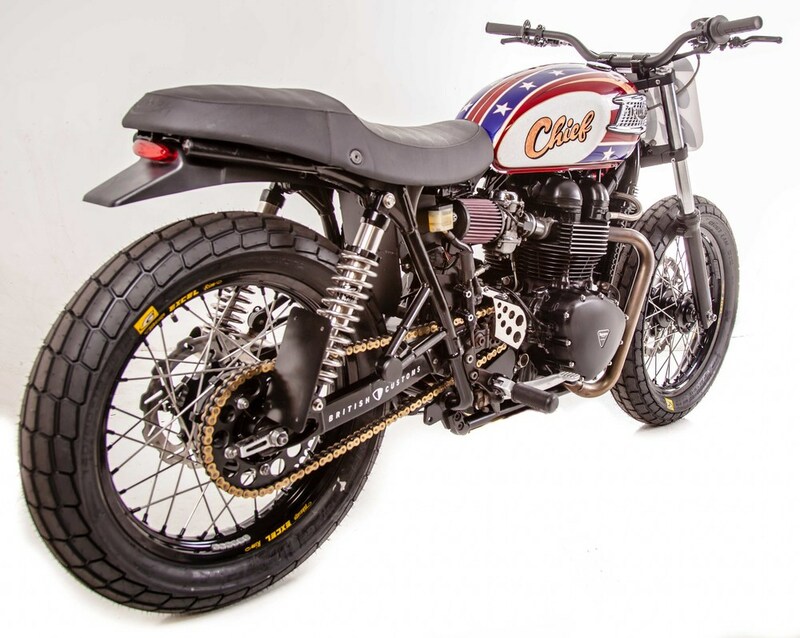 This bike has been featured at many bike shows and trade shows across California. The bike has over 100,000 miles on it, and the owner still rides the bike daily! 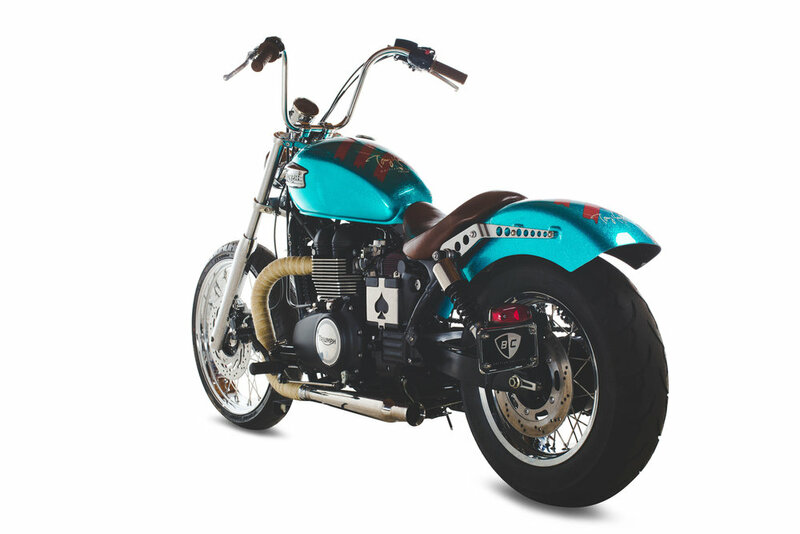 This 1974 Triumph Tiger named W-`ühini aka “The Grasshopper" was custom painted for Deus Ex Machina USA. The grasshopper was builtby Michael “Woolie” Woolaway. 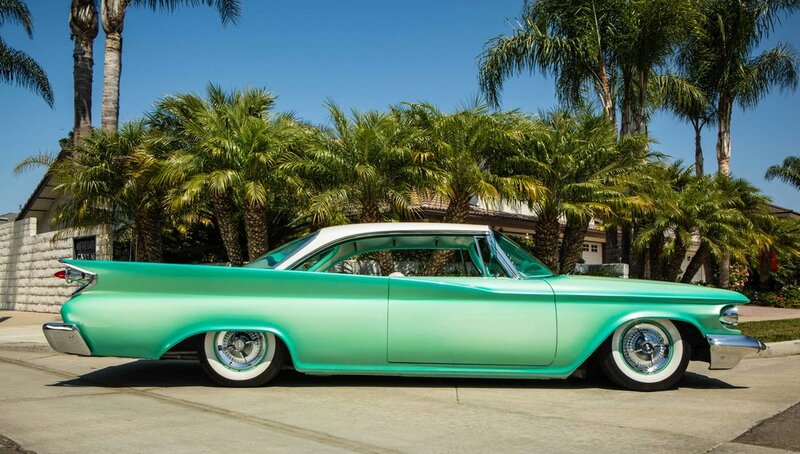 The green paintwork involved using, fourteen coats of House of Kolor Lime Gold Kandy concentrate and an Oriental Blue Kandy coat, then multiple clear coats were applied. Before the paint was applied, the hand-shaped brushed aluminum tank and tailpiece were bead-blasted in certain areas and left brushed in others. 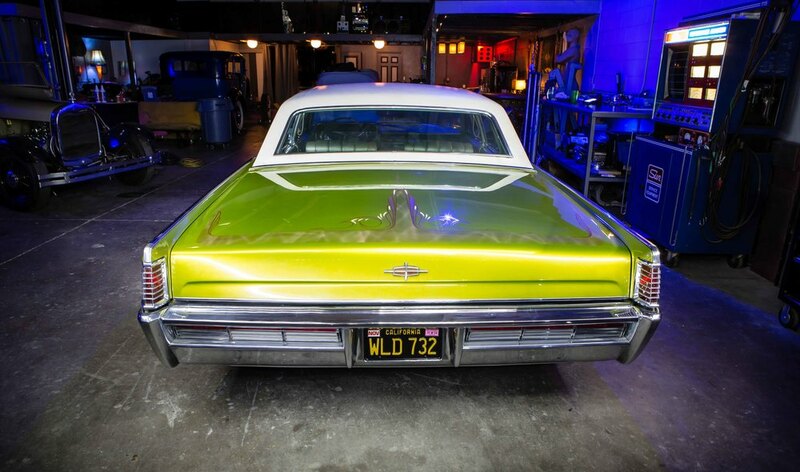 This paint prep technique resulted in the radiant luminescence paint job that you see here. The brushed areas at times presenting the color brighter, while at other times the bead-blasted areas shine. The paint color and intensity changes with angle and perspective and lighting conditions. The motorcycle pieces received a final color sanding and buffing before their final assembly. When this bike is not in use or on tour, it can be seen The Emporium of Postmodern Activities. Deus Ex Machina’s third addition to its global ground fleet of marvel outlets is proudly located at 1001 Venice Boulevard, Venice, CA 90291, USA—one of the most vibrant hubs of surf, bicycle, and motorcycle culture on planet Earth. We removed the water tank and upper ladder assembly. We cleaned up and removed holes in the sides and in the rear of the vehicle. We removed the vinyl wraps and stickers on the truck. Designed and fabricated a new rear floor and front wall of the rear section of the truck. Cut,fabricated and welded the new floor into place. 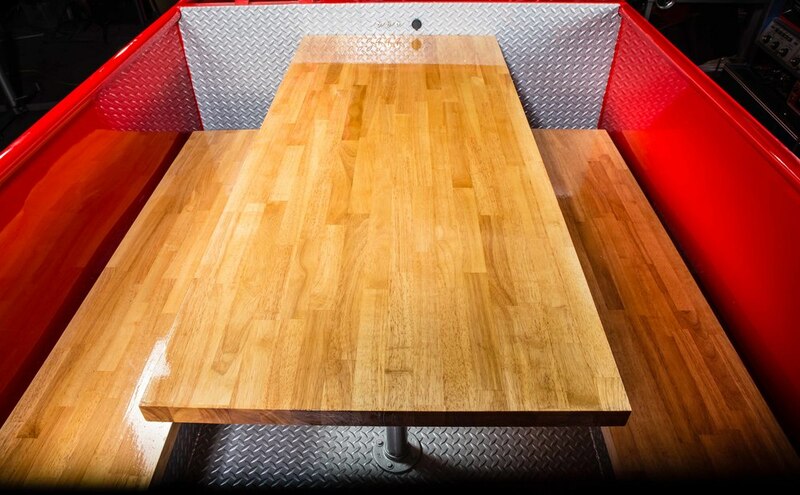 Designed and build custom seating and table in the back of the truck. Cleaned and removed the peeling paint and rust from the body exterior. Completed bodywork as needed to repair the exterior. Painted over half of the Firetruck. The inside of the back of the rear section was bodyworked and painted. Restored and painted the diamond plate. Repaired and rewired all of the lights. Repaired and bled the brakes. Cleaned up and tuned the engine. Rebuilt the carb. Flushed all the fluids. Replaced the rubber hoses as needed on the Engine. Cleaned the interior. Cleaned up the tires and wheels. Polished the aluminum and chrome. We added ambient light to the seating area. Added switches to control the lights and sirens from the rear seating area. USB Charging ports were added to the rear table area. Polished as much of the paint as possible. This bike belongs to the incredible Eddie Mulder. Eddie was born into the world of motorcycling as his father worked for the famous rider Bud Ekins. Eddie was a great racer winning the Pikes Peak International Hillclimb 8 times! 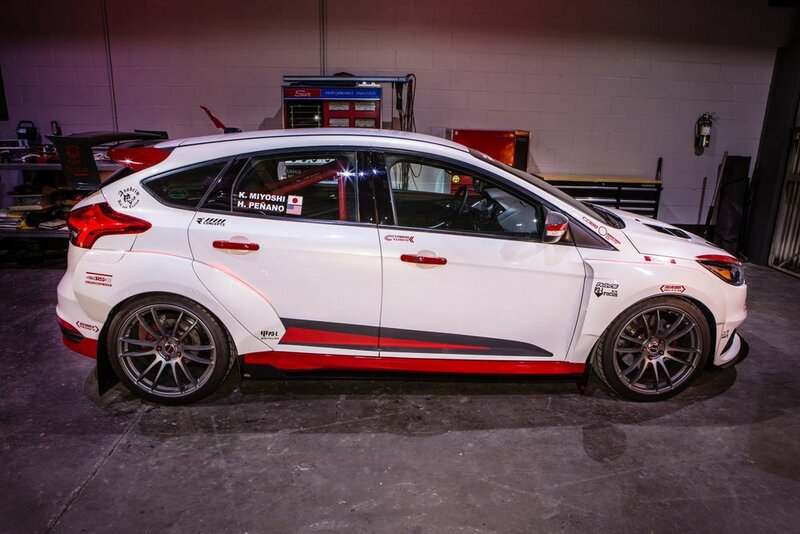 This build here was a replica of one of his Pikes Peak racers. Every detail of the bike was designed and tested to ensure that it not only pays homage to the look, but also performed well. 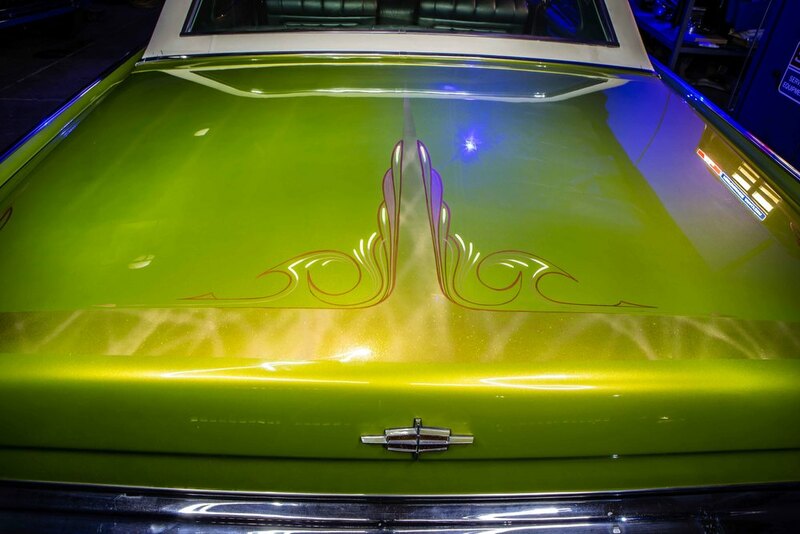 The paint work, hand lettering and pinstripping were done in house at Anaheim Rod and Custom. 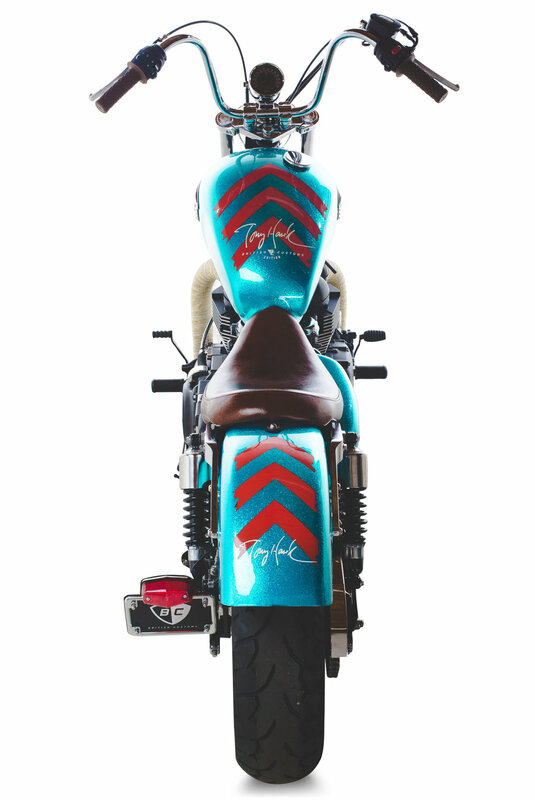 This custom worked and painted Triumph Bonneville pays homage to the famous Gyronaut X-1 that set the land speed record of 245.667 miles per hour in 1966. 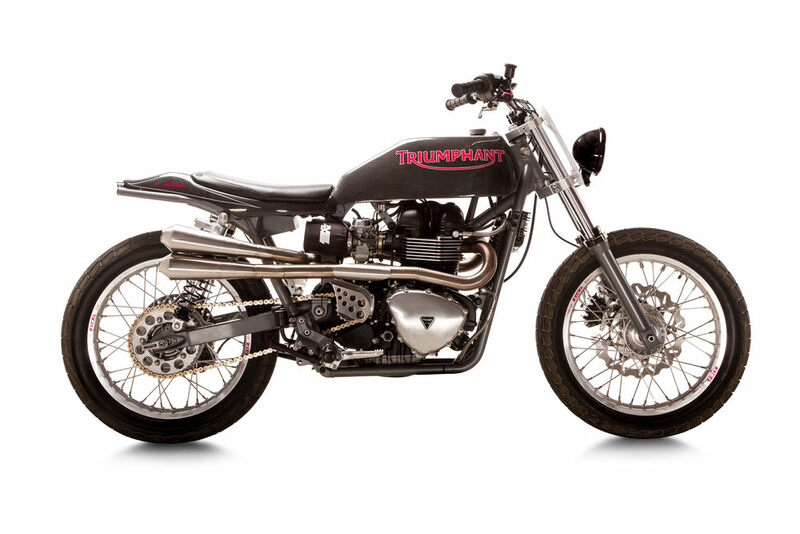 Triumph over Heart Disease: The "Spirit of Gyronaut" is a one-of-a-kind tribute to the legends who built the Gyronaut X-1: Bob Leppan, Alex Tremulis and Jim Bruflodt (and the many others who helped create the World's Fastest Motorcycle). The paint color, design scheme and lettering were created to be replicas of the original X-1 design. 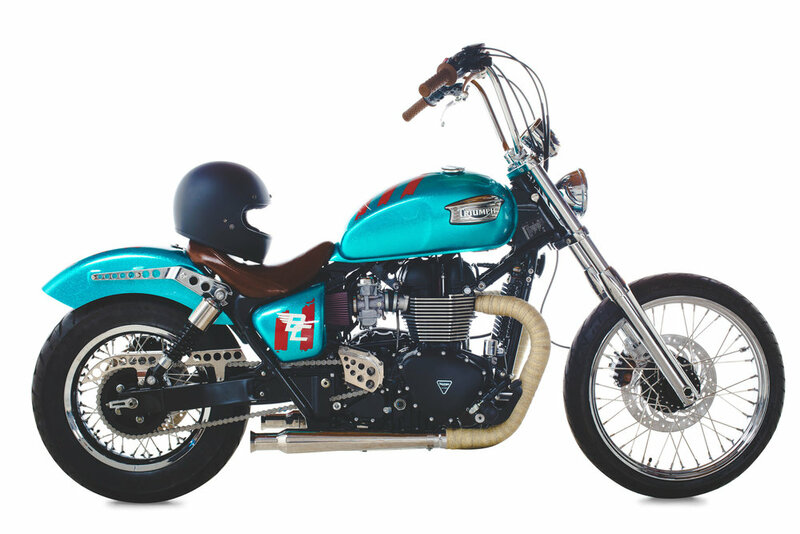 This special Bonneville T100 is to be auctioned off at a major event in 2016 to raise funds and awareness for the Lipoprotein(a) Foundation at a major event in 2016. 2008 Triumph Bonneville "BC Tracker"
This custom made Triumph Bonneville started it's life as a 2008 street bike. 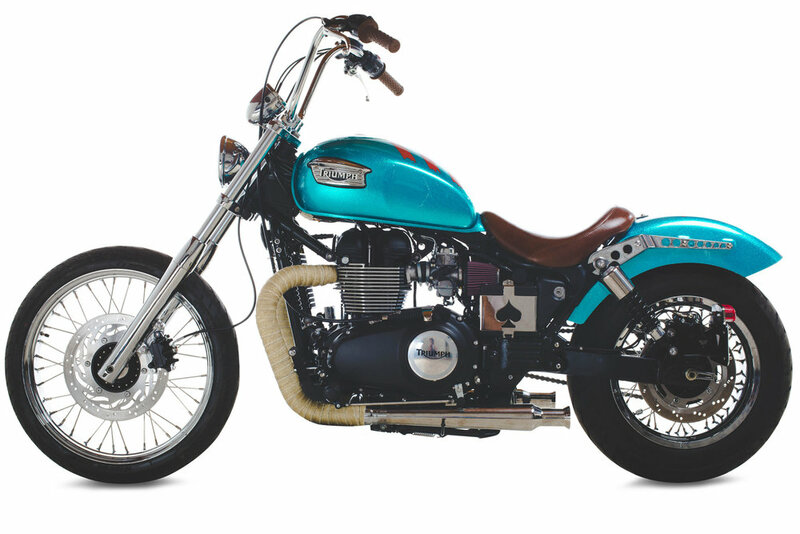 Transformed with the love of British Customs we painted this "Tracker" a scheme to match the styling of the 1960's. This bike was inspired by the heroes of the dirt oval. 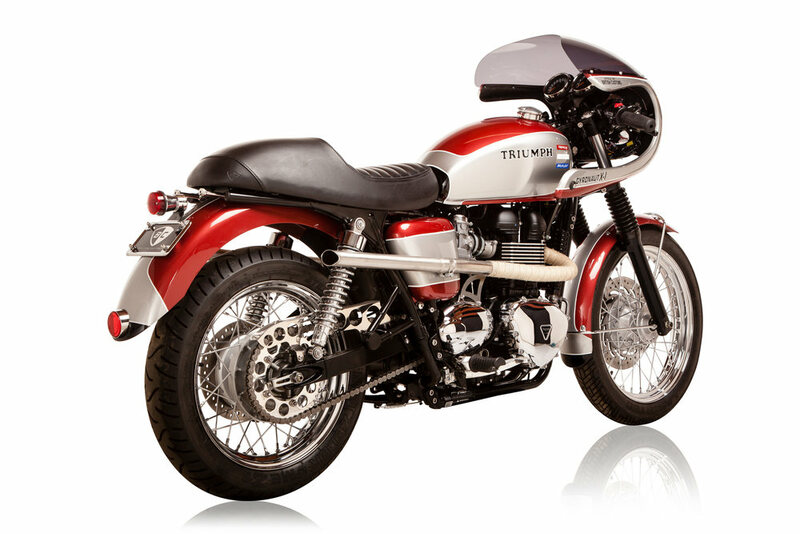 This Triumph Bonneville that was was created by British Customs for celebrity David Beckham. 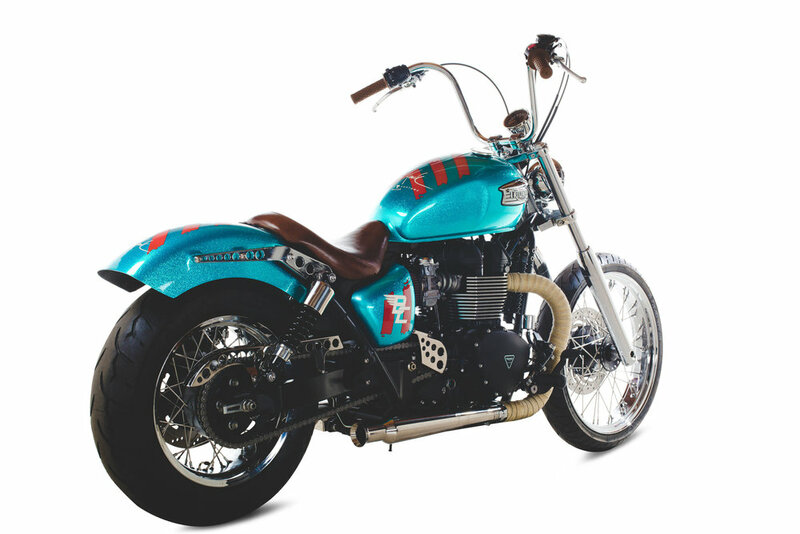 In addition to doing a designing and implementing the custom aged patina paint job on this motorcycle, Anaheim Rod and Custom also had a hand in some of the vehicle's customization. 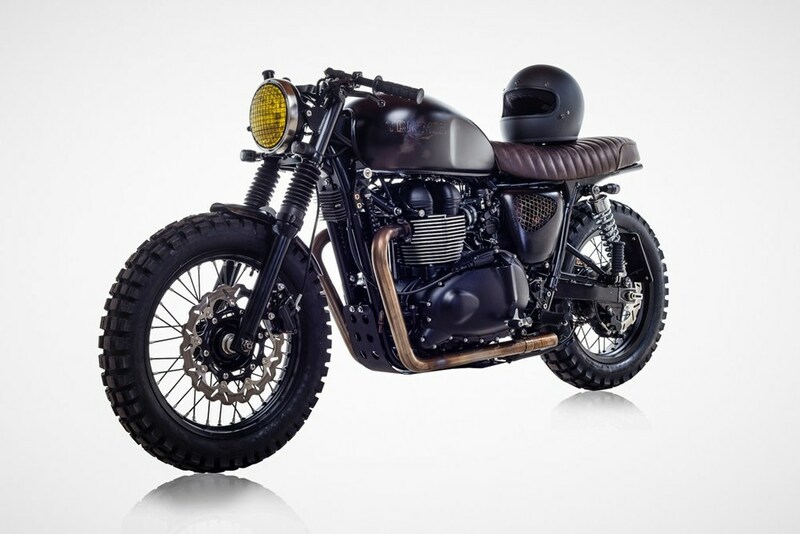 This bike was created to set a hybrid between a cafe racer and a scrambler. We created a custom side cover by cutting a hole and then implementing a wire stainless steel mesh to help aid in airflow to the carburetors. Click HERE to see video footage of the details of this bike. 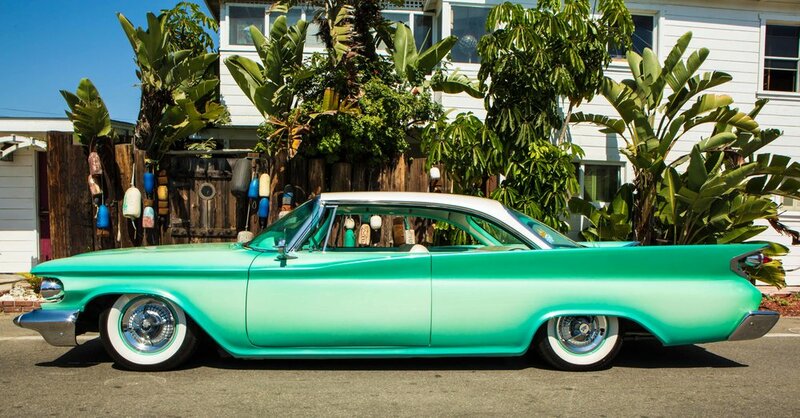 This Lincoln was custom painted by Matthew Means at Anaheim Rod and Custom in 2009. Pinstriping was done by Doug DoRr. The body was sanded and custom mixed with lime candy gold with copper and metal flake scallops. A custom built chrome-molly tri-link rear suspension with air bags was also installed. 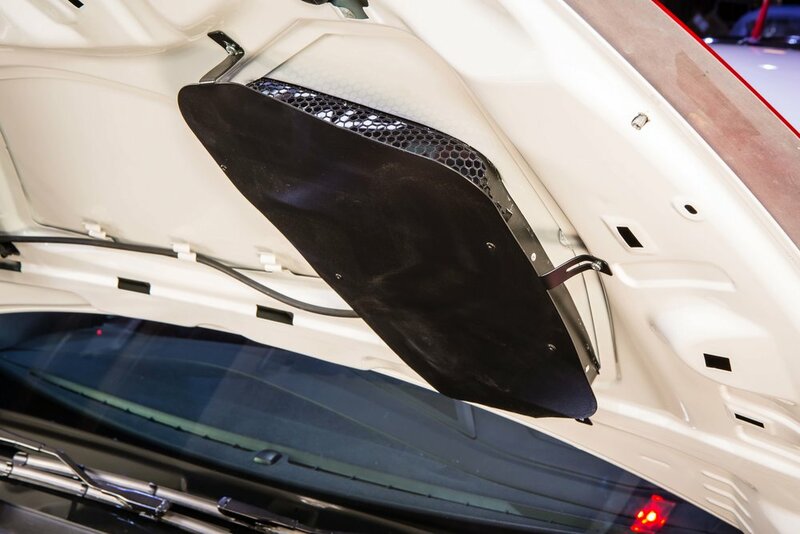 A custom radiator support and radiator with thermostatically controlled electric fans were also installed on this car.